↑ derived from the root ṛc "to praise", cf. Dhātupātha 28.19. Monier-Williams translates "a Veda of Praise or Hymn-Veda"
↑ ('Veda and Vedanta'), 7th lecture in India: What Can It Teach Us: A Course of Lectures Delivered Before the University of Cambridge, World Treasures of the Library of Congress Beginnings by Irene U. Chambers, Michael S. Roth. ↑ Werner, Karel (1994). A Popular Dictionary of Hinduism. Curzon Press. আইএসবিএন ০-৭০০৭-১০৪৯-৩. 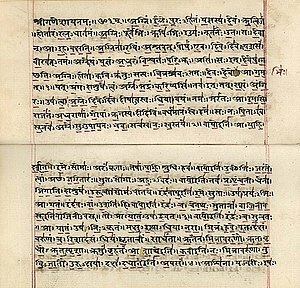 ↑ The oldest manuscript in the Pune collection dates to the 15th century. The Benares Sanskrit University has a Rigveda manuscript of the 14th century. Earlier manuscripts are extremely rare; the oldest known manuscript preserving a Vedic text was written in the 11th century in Nepal (catalogued by the Nepal-German Manuscript Preservation Project ওয়েব্যাক মেশিনে আর্কাইভকৃত ১৮ সেপ্টেম্বর ২০১৪ তারিখে, Hamburg. editio princeps: Friedrich Max Müller, The Hymns of the Rigveda, with Sayana's commentary, London, 1849-75, 6 vols., 2nd ed. 4 vols., Oxford, 1890-92. Sontakke, N. S., সম্পাদক (1933-46,Reprint 1972-1983. ), Rgveda-Samhitā: Śrimat-Sāyanāchārya virachita-bhāṣya-sametā (First সংস্করণ), Pune: Vaidika Samśodhana Maṇḍala অজানা প্যারামিটার |editor-last-2= উপেক্ষা করা হয়েছে (সাহায্য); অজানা প্যারামিটার |editor-first-2= উপেক্ষা করা হয়েছে (সাহায্য); Authors list-এ |প্রথমাংশ1= এর |শেষাংশ1= নেই (সাহায্য); এখানে তারিখের মান পরীক্ষা করুন: |তারিখ= (সাহায্য)উদ্ধৃতি টেমপ্লেট ইংরেজি প্যারামিটার ব্যবহার করেছে (link) . The Editorial Board for the First Edition included N. S. Sontakke (Managing Editor), V. K. Rājvade, M. M. Vāsudevaśāstri, and T. S. Varadarājaśarmā. ed. Sontakke et al., published by Vaidika Samsodhana Mandala, Pune (2nd ed. 1972) in 5 volumes. Rgveda-Samhitā Srimat-sāyanāchārya virachita-bhāṣya-sametā, ed. by Sontakke et al., published by Vaidika Samśodhana Mandala,Pune-9,1972 ,in 5 volumes (It is original commentary of Sāyana in Sanskrit based on over 60 manuscripts). Adolf Kaegi, The Rigveda: The Oldest Literature of the Indians (trans. R. Arrowsmith), Boston,, Ginn and Co. (1886), 2004 reprint: আইএসবিএন ৯৭৮-১-৪১৭৯-৮২০৫-৯.